So called “green energy” is that produced by harnessing power from solar, wind, wave and tidal sources. Ecotricity claims that some green energy companies, mostly those that burn biomass, also burn animal byproducts. The horror. The Ecotricity website lists those offending British companies. Posted in Climate change, Energy and tagged renewable energy, vegan energy on August 6, 2018 by wryheat2. Renewable energy for generation of electricity (solar and wind) is the politically correct panacea to fight the bogeyman of global warming. However, experience has shown that replacing electrical generation by fossil fuels with wind or solar generation makes the power supply unreliable and leads to electrical grid instability, much higher electricity costs, environmental problems, and very little decrease in carbon dioxide emissions. The renewable energy industry would probably not exist without mandates and subsidies. Fossil-fuel generated electricity responds to demand and is available 24/7; solar or wind generated electricity is not. Posted in Energy and tagged electricity generation, fossil fuel, renewable energy on July 16, 2018 by wryheat2. Neither addresses the real issue: electricity produced from utility-scale solar and wind is unreliable, expensive, plays havoc with electrical grid stability, and is not as green as advertized. Rather than play with tricky fixes, the Arizona legislature should repeal the Arizona Corporation Commission’s renewable energy mandate and forbid the ACC from mandating how electricity is generated. I can find no place in the Arizona Constitution nor in the Arizona Revised Statutes that gives the ACC authority to impose such mandates. The Arizona Corporation Commission was established through the state constitution to regulate corporations, public utilities, securities, and other investments. But in an unprecedented move, the Arizona Corporation Commission sought to single-handedly determine alternative energy policy in Arizona with a bold and unconstitutional energy mandate in 2006.1 This mandate forced energy producers to embrace state-favored alternatives instead of deciding for themselves which options are most attractive in Arizona. Arizonans now face the real threat that the Arizona Corporation Commission will continue to seize power meant to be held by the state’s legislative branch. Important decisions about energy policy, corporate governance, and other areas have been removed from the legislative process which, for all its faults, offers more transparency, citizen input, and accountability than the opaque and bureaucratic proceedings of the Arizona Corporation Commission. The framers of the Arizona Constitution had serious concerns about the Commission’s potential to abuse its authority. Records of the state constitutional debate show the constitution’s authors intentionally limited the Commission’s powers to prevent interference with internal business decisions. The framers’ fears have been borne out. The Commission’s attempt to act as the state’s de facto energy czar clearly oversteps its original role. Arizona courts should re-establish a proper balance between the Commission and legislative power. Courts in other states with similar utility regulatory commissions already have concluded such agencies don’t have constitutional authority to mandate statewide policy. The Legislature also can reassert its authority by ordering an audit of the Commission that would recommend ways to streamline the agency and to restore it to its proper role. Finally, the state constitution could be amended to transfer necessary functions to other agencies and decommission the ACC to stop its policymaking power grabs, which Arizona’s founders specifically aimed to prevent. 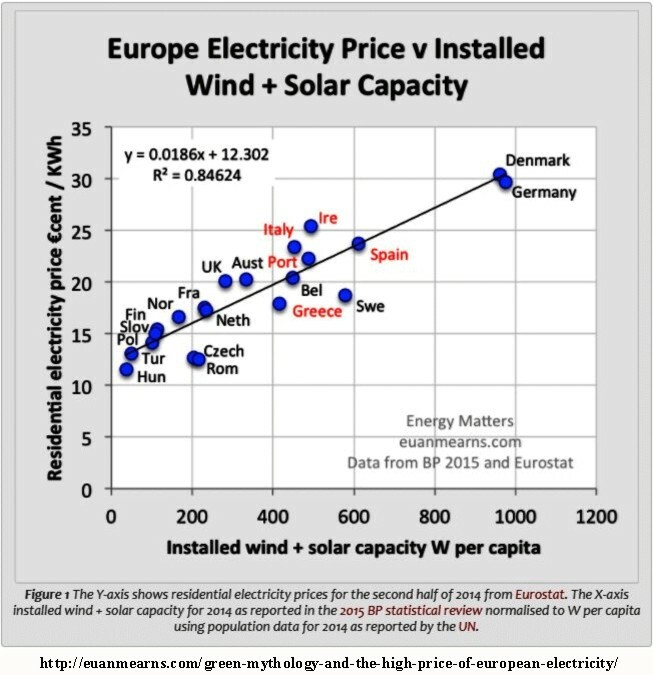 The more installed solar and wind capacity per capita a country has, the higher the price people pay for electricity. “What physical evidence supports the contention that carbon dioxide emissions from burning fossil fuels are the principal cause of global warming since 1970?” I posed that question to five “climate scientist” professors at the University of Arizona who claim that our carbon dioxide emissions are the principal cause of dangerous global warming. Yet, none could cite any supporting physical evidence. The “greenhouse” hypothesis of global warming makes four major predictions of what we should see if the “greenhouse effect” is intensified by adding carbon dioxide to the atmosphere. All four predictions are shown by physical evidence to be wrong. An alternative hypothesis with observable evidence. Results from climate models based on the assumption that carbon dioxide controls global temperature diverge widely from reality. Posted in Climate change, Energy, Politics and tagged climate, renewable energy, solar, wind on April 9, 2018 by wryheat2. Solar and wind generation are not practical alternatives to fossil fuel-generated electricity. Biofuel is not practical for transportation. We are now seeing the consequences of politically correct green policies on energy. Some of America’s most prominent politicians want national mandates for renewable electricity. Had these politicians considered the surge in electricity costs that have occurred in Europe in recent years, they might have been less eager to push such mandates. Between 2005, when the EU adopted its Emissions Trading Scheme, and 2014, residential electricity rates in the EU increased by 63 percent, on average; over the same period, residential rates in the U.S. rose by 32 percent. EU countries that have intervened the most in their energy markets—Germany, Spain, and the U.K.—have seen their electricity costs increase the fastest: during 2008–12, Germany’s residential electricity rates increased by 78 percent, Spain’s rose by 111 percent, and the U.K.’s soared by 133 percent. States which offered substantial taxpayer support for green energy pay a lot more for electricity, according to a Daily Caller News Foundation analysis. The most notable examples of this trend were California and West Virginia. California had some of the nation’s highest power prices, paying 14.3 cents per kilowatt-hour, and had a whopping 183 policies offering support to green energy. In contrast, West Virginia had some of the nation’s cheapest power at 7.91 cents per kilowatt-hour and a mere 11 policies. Devastating Finding: New Study Deems Solar PV Systems In Europe “A Non-Sustainable Energy Sink”! Despite hyped claims, much doubt has emerged over the years on whether or not renewable energies such as wind and sun would able to substitute fossil and nuclear energy. Getting a sound answer to that question naturally would have been a reasonable step to take long before countries rushed to invest tens of billions of euros. A brand new paper by Swiss researchers Ferruccio Ferroni and Robert J. Hopkirk published by the Journal of Energy Policy now further intensifies that doubt, finding that solar power remains an inefficient way to produce energy in most cases. It’s beginning to appear that Europe has wasted tens of billions of euros in a mass energy folly. Thus it should not surprise anyone that Germany’s fossil fuel consumption has not been falling over the past years. So is solar energy a worthwhile alternative in places like Europe? The authors conclude that it is not. They write in the conclusion that “an electrical supply system based on today’s PV technologies cannot be termed an energy source, but rather a non-sustainable energy sink” and that “it has become clear that photovoltaic energy at least will not help in any way to replace the fossil fuel“. Posted in Energy and tagged biofuel, renewable energy, solar, wind on May 10, 2016 by wryheat2. President Obama recently said that he wanted 28% of America’s electricity to come from renewable energy by 2030, mainly by increasing the use of wind and solar power. 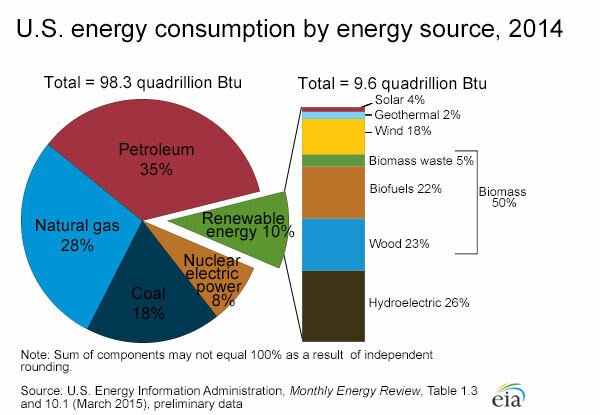 Currently about 10% of US energy is produced by renewable energy sources. Current average electricity cost in the U.S. is 12.95 cents per kilowatt-hour (kwh), according to the EIA. See EIA reported costs by state and region here. So what happens as a country increases the amount of electricity generated by renewal sources (mainly wind and solar) as the European Union has been doing? As renewable energy becomes a larger percent of electricity generation, costs per kwh rise from about 12 cents per kwh to 32 cents per kwh. 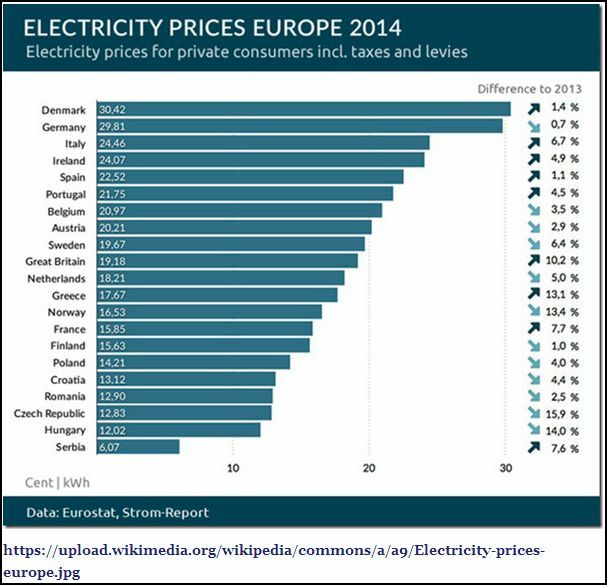 Here are the costs of electricity by country in the European Union. 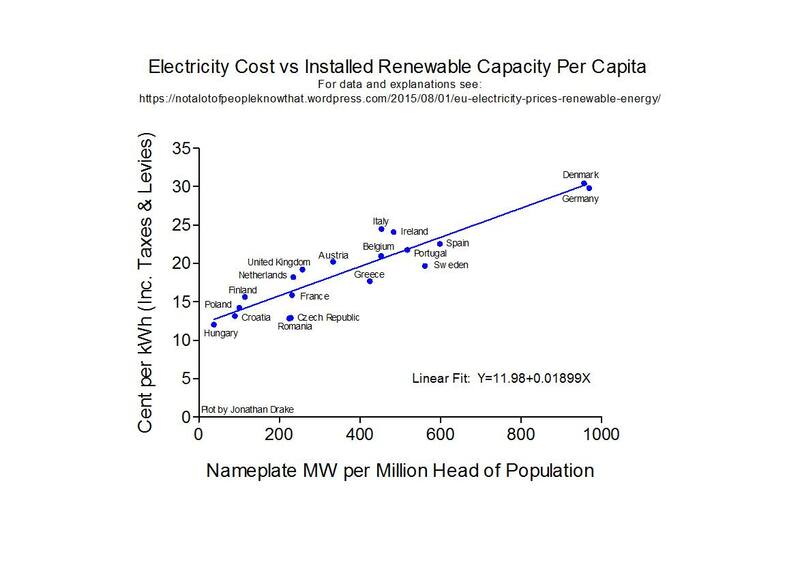 The highest costs are in the countries with the most renewable energy capacity. Under Obama’s plan, if the U.S. follows the European Union example, electricity costs will nearly triple in the next 15 years. Obama is keeping a campaign promise. Remember he said that under his plan electricity rates would necessarily skyrocket. That is the reality of the war on coal and other fossil fuels. And that’s not our only expense. According to the EIA, for just the period 2010-2013, we taxpayers have subsidized wind power to the tune of $5.5 billion together with $4.5 billion for solar installations. In my opinion, Obama’s power plan is a foolish, even criminal, waste of resources. The proposed aid package to help people mitigate damage from hurricane Sandy is a good illustration of why the government can’t decrease spending. Instead of just dealing with storm damage, Obama’s $60.4 billion request for hurricane Sandy relief, which was passed by the 112th Senate but not the House, has morphed into a pork-laden give-away to special interests. The 113th Congress has passed an interim $9.7 billion aid bill leaving the remainder in limbo. According to the New York Post, the hurricane Sandy aide package included: $8 million to buy cars and equipment for the Homeland Security and Justice departments; $150 million for the National Oceanic and Atmospheric Administration to dole out to fisheries in Alaska; $2 million for the Smithsonian Institution to repair museum roofs in DC; $13 billion for”mitigation” projects to prepare for future storms; $207 million for the VA Manhattan Medical Center; $41 million to fix up eight military bases along the storm’s path, including Guantanamo Bay, Cuba; $4 million for repairs at Kennedy Space Center in Florida; $3.3 million for the Plum Island Animal Disease Center and $1.1 million to repair national cemeteries. “The fiscal cliff deal is not only preventing certain politically motivated energy tax policies from falling off the cliff, but it’s also resurrecting ones that have been dead and buried for a year. “Lumped into the 157-page fiscal cliff bill are extensions of energy handouts that were originally scheduled to retire, as well as retroactively rewarded tax breaks for renewable energy that expired at the end of 2011. The inclusion of these targeted tax breaks is a clear indication that Congress is not serious about (1) reducing spending, (2) ending the government’s meddling in the energy sector, or (3) standing up against political interests. “The extension and resurrection of the targeted tax credits will reduce revenue by $18 billion over 10 years. Production tax credits for wind (totaling $12 billion) were renewed for another year and made even more generous. Thanks to the new bill, wind and other renewable energy projects can receive the tax credit simply by starting construction by 2013, rather than once they begin generating electricity, as the law originally specified. This situation reminds me of a quote attributed to former British Prime Minister Margaret Thatcher: “The problem with socialism is that eventually you run out of other people’s money.” Congress has yet to acknowledge that caveat. Apparently, nothing in Washington, D.C. can be straight forward. Instead, almost everything is laden with pork-packed proposals for pet projects.